Pretention isn't everything. More at 11! I'm always skeptical about these indie artists, but not because they might not be talented enough to make it to the big leagues of popular music. Indeed, there are many artists and bands that remain unsigned their entire lives and have more talent in their pinky toe in a single minute than most mainstream artists could ever dream of possessing during their massive 15-minute careers. No, I'm always concerned because of a strange vibe I get from some indie artists, a pretentious vibe, one not necessarily of superiority, but one comprised of their boasting of their supposedly profound and esoteric way of thinking. I can usually tell more by their lyrics, filled with wanton abstraction, lyrics that simply sound so unnatural that you get the sensation of forced poeticism, when they could very well simply be straightforward and honest instead of arbitrarily clandestine. 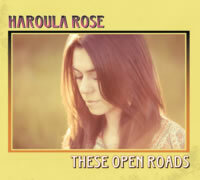 I had to research a bit about Haroula Rose before I could review her album, "These Open Roads", so I headed straight to her website. To find out about her, I checked out her "About" page. I believe my previous paragraph is a clear indicator of what I discovered. An excerpt from her website is as follows, as the first real part of her autobiography: "One Autumn I hid in some piles of leaves gathered by Lake Michigan. An old lady saw me and asked where the swimmer was. I said it was probably too cold for swimming that day. She walked away." This left a sour taste in my mouth, and the rest, however brief it was, failed to give me any additional knowledge. If this is how she presents herself to her audience, I'm scared to listen to the music. But I will still give her the benefit of the doubt! When listening to the almost therapeutic effects of the first song, Brand New Start, my fears were soon alleviated. The average layperson (this season, portrayed by yours truly) can actually connect with this. I presumed this would be an acoustic affair, but there are also some strange echoing, haunting noises that surround the production. On purpose, I assume, but I can definitely sense that there may be more to this album than meets the eye, based solely on a cryptic website and photos of Ms. Rose in retro garb. Love Will Follow continues the trend, showing that this album will end up being a personal journey more than anything massive, and that's fine. I do hope that she whips out a few surprises along the way, and that the songs don't all blend together in the brain. Other tracks like Another Breakup Ballad show a more peppy version of Ms. Rose, delivering an upbeat story while maintaining her musical folksy countryside physique. But then the album starts to fluctuate between the heavyhearted (Duluth, Close My Eyes To See, Lavender Moon) and the more chipper (Free To Be Me and New Year's Day, the former sounding more like a commercial for cat treats than anything else), a sort of teeter-totter effect. The variety of instrumentation is impressive enough, from the standard guitar and piano to less frequent items such as mandolin, accordion, whistle, and the ever-uncommon Marxophone, and it shows the malleability of her sound. As I've seen here, the only way to really judge an artist, indie or otherwise, is by the music he or she produces, and not by the silly persona they have outside the words of their songs. Haroula Rose has seemingly succeeded at what she has attempted to do: try and develop an intimate rapport with the listener. I know her a little better now. Not THAT much better, mind you, but a little better. This album is suitable for a quiet rainy day or by the embers of a subdued campfire more than for more public or party listening, so if you find yourself needing a bit of comfort and are in a location conducive to relaxation, maybe Haroula Rose can provide just what you need.